These old (1999-ish) notes are about Dr. Henry Pym (aka Ant-Man, then Giant Man)’s vintage appearances. They were done using early Marvel Masterworks and other reprints, and cover his appearances up to 1965. This is an emergent history profile. It focuses on how his gear and power works back during the early 1960s, back when we all looked respectable with suits and hats and whatnot. 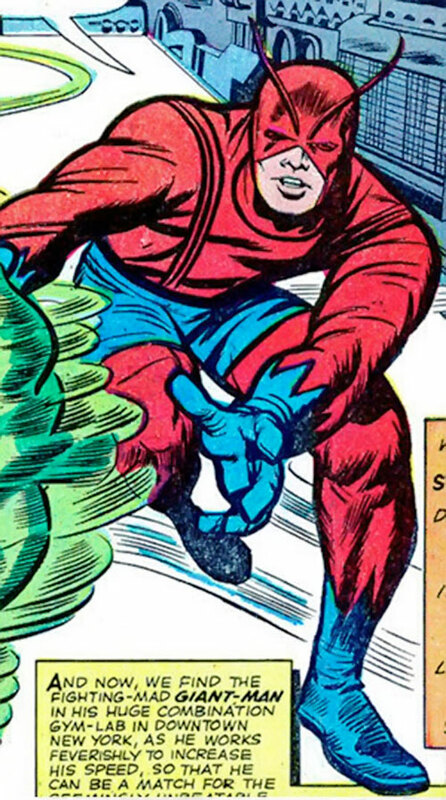 Real Name: Henry “Hank” Pym. Marital Status: Separated (presumed widowed). Known Relatives: Maria Trovaya Pym (ex-wife, presumed dead). While shrunk, he still has his full strength ; thus, he can jump as far as he normally could, but should he fall that same distance, it would be almost certain death. At the GM’s discretion, any effect whose OV/RV ought to be based on weight and not STR, should use Ant-Man’s actual weight. For example, a small stream of water from a water gun was able to push him to certain doom (the sewer grate beyond the curb). Likewise, some things that would not harm a normal-sized human can be a deadly threat to an ant-sized person ; when Ant-Man was sitting on a car’s engine, the car’s horn nearly deafened him. His Martial Artist ability represents his mastery of judo, which enables him to fight off ants that are the same size as he is, even before he discovered that he retains the strength of a full-grown man when shrunk. He is on friendly terms with all the ants of the city, which seem to have a certain amount of sentience. Whenever an ant anywhere hears his name (“Ant Man”), they communicate this fact from one ant to another, until finally, Ant-Man himself hears the news. Likewise, if the ants see criminal activity, they are capable of recognizing it and relaying the news to Ant-Man. Alternatively, Ant-Man can have the ants trail an enemy. 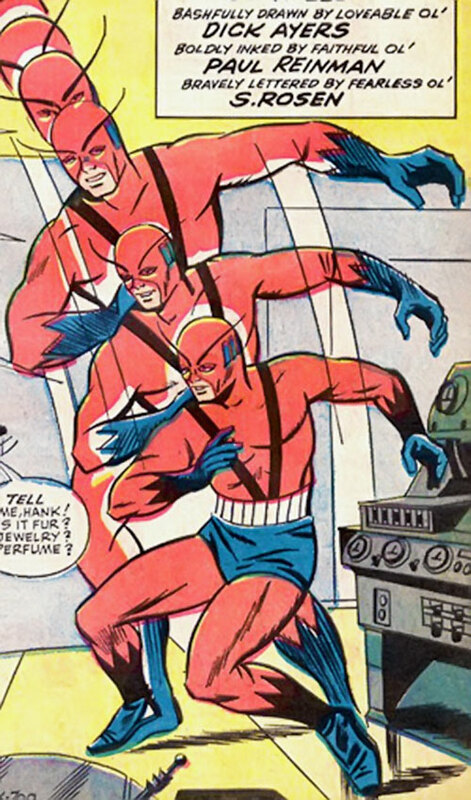 Ant-Man can also tell the ants to be on the look-out for certain spoken words, such as “protector” or “disintegrating ray”. The ants are his friends not his forced servants. Thus, Egghead’s attempt to turn the ants against him was doomed to failure. 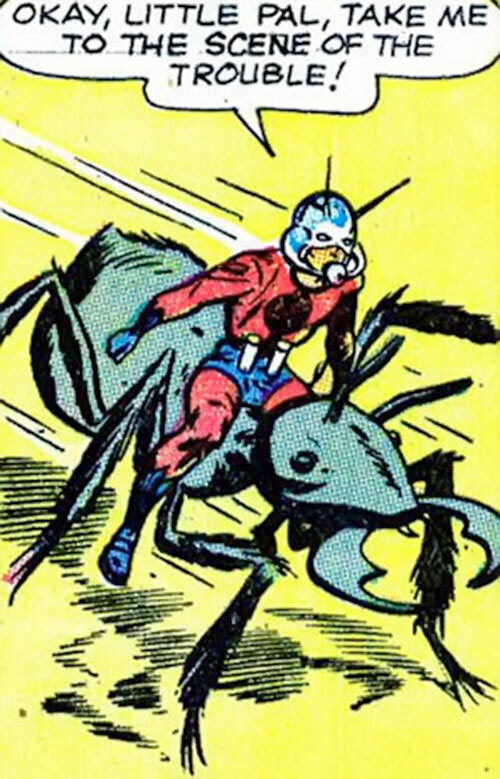 Likewise, when the Scarlet Beetle turned all the other insects against humanity, the ants remained loyal. Once, when captured and divested of his equipment, the ants took it upon themselves to rescue him. When another foe mind-controlled him into committing suicide, the ants came to his rescue without having been asked to do so. When the Wasp became his sidekick, the ants accepted her as a friend. With his telepathy, Ant-Man can give the ants rather complicated plans for them to put into action. Among the ants that he has available to him are the usual worker ants, flying ants, and even honey ants, who have a limited Glue power (representing the “honey” that they can produce). Enough honey ants can clog up a gun or similar gadget, making it useless. His lab has a secret entrance, only usable by an ant-sized character. It has a short tunnel from the outside, leading to an ant-sized elevator up to the lab, with the door being a secret panel. It also contains his catapult. Originally planning his shrinking serum to be a boon for mankind, enabling easy transport for food or troops, he abandoned this idea when he gave up on his serum when it caused him to encounter dangerous ants. He later revisited the shrinking idea and used it (and other inventions) to become Ant-Man. In September 1963, he joined the Avengers. 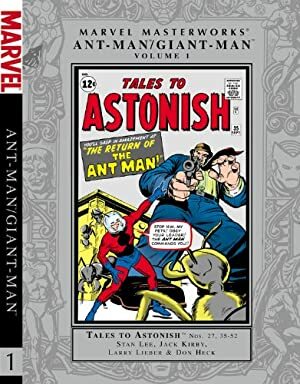 He becomes Giant-Man in Tales to Astonish #49 (November 1963). In January 1964, Giant-Man spends some time training in order to try to catch the Human Top (later known as Whirlwind) ; it is at this time that his Dex improves to 6 APs. 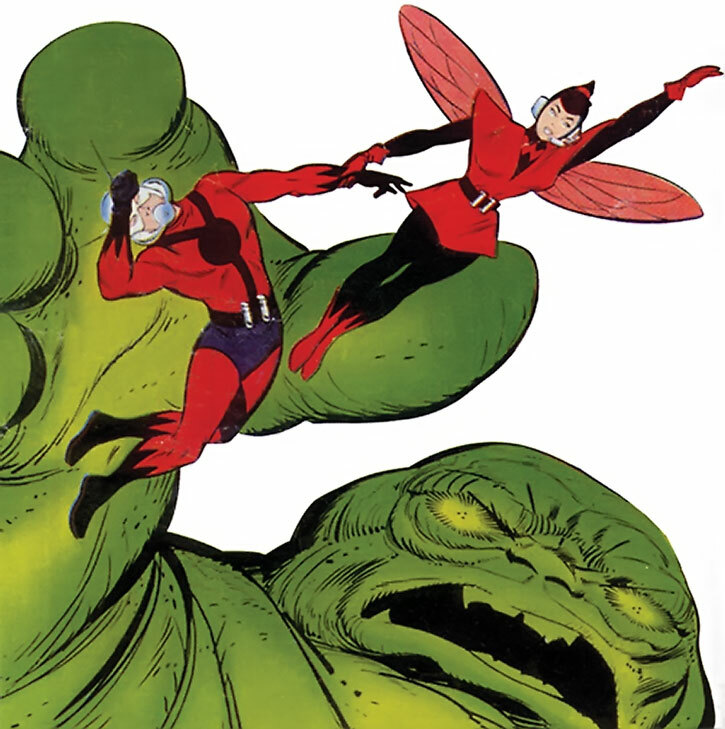 During his days as Giant-Man, he alternates between calling himself Giant-Man (when using Growth) and Ant-Man (when using Shrinking). He then becomes the “new” Giant-Man, who can only change to 35’ high and back again. Originally, Hank began life as nothing more than the average mad scientist. After becoming a hero, his personality developed into the standard Marvel slightly insecure hero personality. For example, while romantically involved with the Wasp, he found it difficult to work up the nerve to ask her to marry him. Since he wouldn’t propose, the Wasp would try to make him jealous to make him propose, which instead made him feel that the Wasp would never want to marry him, so he wouldn’t ask. Joining the Avengers would make most people feel more confident, but not Hank. 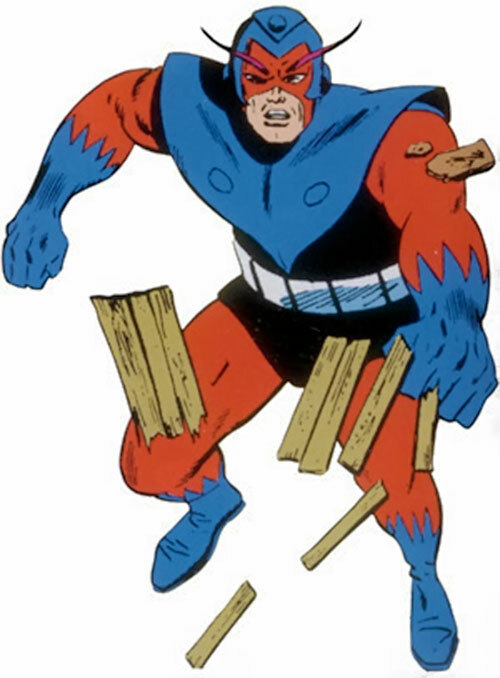 After changing to his Giant-Man persona, he found himself often comparing strength with the likes of Iron Man, Thor, Hulk, Wonder Man, and Sub-Mariner. In every such contest, he (of course) came out the loser. And, of course, strength is the only contribution that Giant-Man could provide (except when he would fall back on his Ant-Man powers, which were far from impressive). At this point, his insecurities had not yet developed into major mental problems, but he was certainly not the most stable Avenger. For example, when the Wasp was critically injured, he snapped until she was saved. However, he was sensible enough to realize when he needed to take a leave of absence with the other founding Avengers. However, his troubles were just beginning… (to be continued). At the beginning of his career, his DEX was merely 04. After January 1964, his DEX improved to a 06. Headquarters (confined; his lab with a secret Ant-Man sized room), Genius, Scholar (insects), Scholar (molecular cell transition and cell specialization, ie, giving people insect powers), Pet (Korr), Sidekick (Wasp). The Ants of New York City (High) (see below for details). Secret Identity, Obsessive Fan Club, SIA to only using Gadgetry in a way that has some connection to insects. ANT-MAN COSTUME [BODY 07, Skin armour: 04, Limitation : Skin armour only vs. slashing/edged attacks]. This costume is designed of a finely woven steel mesh. It was designed to protect Pym against stings and bites. It works so well, that it even protects him from an ant bite when he is ant-sized! This costume also contains canisters full of growth and shrinking gas. 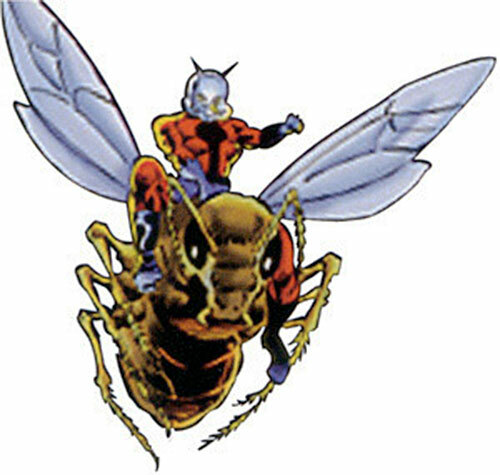 ANT-MAN HELMET [BODY 05, Animal Summoning: 12, Animal Control: 04, Speak with Animals: 08, Telepathy: 12, Detect (insects): 05, Iron Will: 07, Limitation: Telepathy and all animal powers only work on ants, though given time (1 AP), Ant-Man can adjust the frequencies to work on different insects ; as Giant-Man, he no longer needs to spend time making such adjustments. Limitation: The helmet can not transmit signals through glass]. 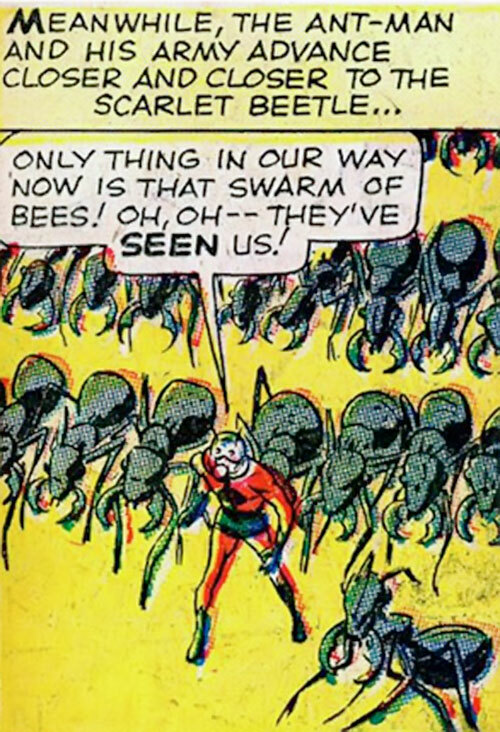 Note that Ant-Man almost never needs to use Animal Control on ants since the ants in New York are his friends, even when he doesn’t have powers. GIANT-MAN COSTUME [BODY 01]. This costume provides no special protection. However, it has a less-bulky helmet included under the mask, with all the powers of the ANT-MAN HELMET. Furthermore, it includes “super-sensitive cybernetic antennae” which adds Extended Hearing: 02 to the helmet’s powers as well as a variation on the “Sharp Eye” advantage, which works only for perception checks based on sound. Furthermore, both Detect and Telepathy work with the Wasp (at least while she’s shrunk and has antennae herself). However, he seems to have lost Iron Will. NEW GIANT-MAN COSTUME [BODY 01]. This looks much like the previous Giant-Man costume, except that the helmet has changed designs again. Unlike the previous costume, this one has a very obvious helmet. Pym added a device that would enable him to change the size of others, which allows him to grant his Growth power to other creatures (Growth has the Usable On Others Bonus). The size-change controls are in his shoulder pads as well as in his helmet, so even without his helmet, he can touch buttons that will change his size. At this point, he is impressed by Madam Macabre who seems to be able to change the size of nonliving objects, whereas he seems to think he can only do it with living objects (a fact contradicted by previous appearances). Shrinking/Growth Serum/Gas [BODY 01, Shrinking: 10, Growth: 12, Digging: 06, Jumping: 01]. 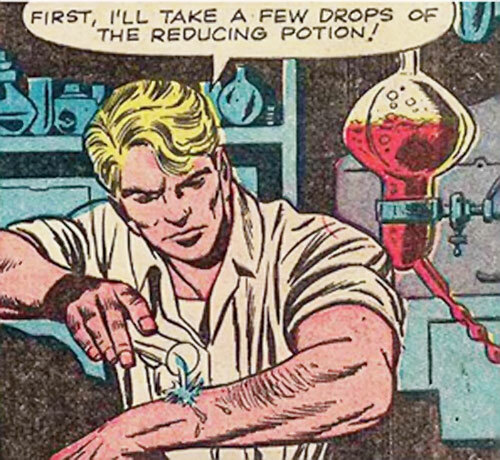 Originally, Pym created two serums : a shrinking serum and a growth serum, which would shrink or enlarge anything that he poured them on. He later developed this into a gaseous form (in canisters on his belt) that he would breathe through the filters in his mask. At this time, the phrase “Pym particle” has not yet been mentioned. When he became Giant-Man (shortly after turning Janet van Dyne into the Wasp), he eliminated the gas in favor of capsules of various colors, each creating a different amount of size change ; these capsules (to be taken like pills) are stored in a sort of utility belt. Taking more than one shrinking capsule at a time causes the victim to shrink all the way out of sight and be lost potentially forever ; likewise it is theoretically possible to grow through the stratosphere, but that would only happen as a result of carelessness (such as when a crook stole Giant-Man’s costume and was learning how to make it work). 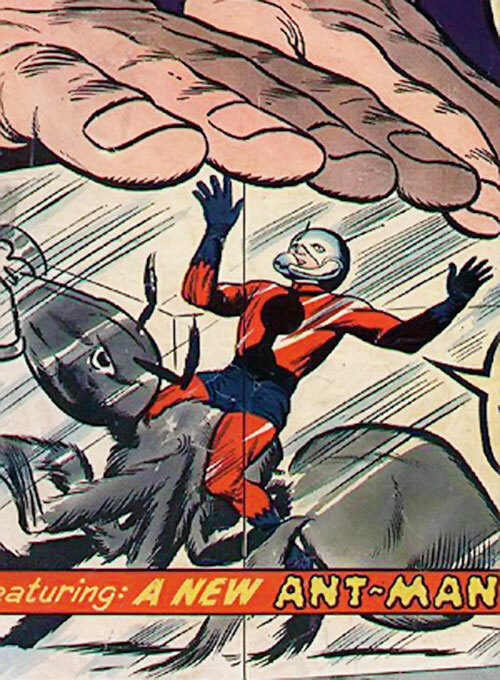 As of Tales to Astonish #58 (August 1964), Pym finds a way to activate the size changes by sheer mental power (with the help of his cybernetic helmet). Furthermore, he can activate the Wasp’s size changes too. Shrinking does not reduce STR. When shrunk, his voice is too tiny to be heard by other people… at least until he gets some experience. By the time he becomes Giant-Man, this is no longer a problem. 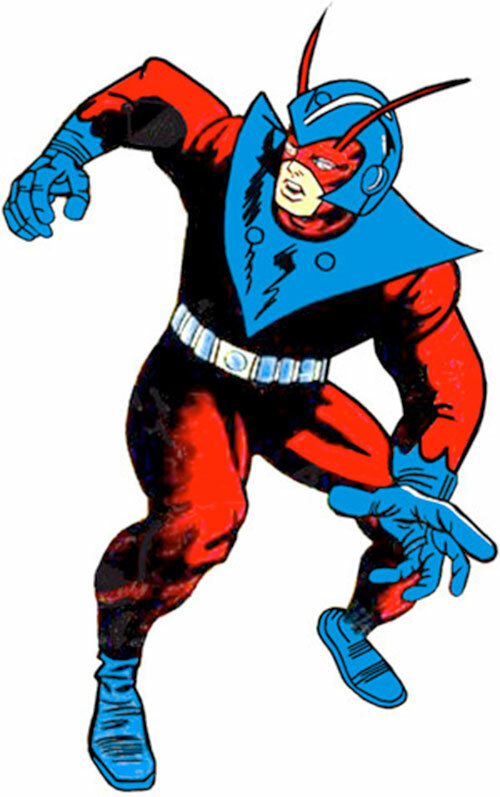 Until he becomes Giant-Man, Growth is almost never used, though the Scarlet Beetle used it to go from beetle-size to slightly larger than man-size. When using Growth, he does not suffer the full DEX reduction ; he loses one less AP of DEX than normal, so that when using 3 APs of Growth, his DEX is not reduced at all. If more than 3 APs of Growth are used (making him more than 12 feet tall), he becomes too big to support his own weight, and can only lie helpless on the ground (at least originally). Later on, when he used more than 3 APs of Growth, half the APs of Growth above 3 would subtract from his Strength instead of adding to it. Growth only adds half its APs to his BODY (but round up). So, when using his usual 3 APs of Growth (for a 12’ height), he has a DEX of 06 (after fighting the Human Top), STR of 07, and a BODY of 06. His maximum height is about 100 feet tall. When he uses all 12 APs of Growth, to achieve that height, his DEX is reduced by 4 from 06 to 02, his STR is increased by +3 for the first 3 APs and decreased by 4 (half of 9) for the other 9 APs giving him a STR 03, and his BODY is increased by 6 from 4 to 10. Giant-Man has learned to both use and deactivate Shrinking in the same phase, something not normally possible, and he can do the same with Growth as well. Furthermore, deactivating a power doesn’t count as an action, so that in one turn, he can deactivate Growth (not an action), shrink to ant-size (Auto Action), take a move action (Auto Action), deactivate shrinking (not an action), and reactivate Growth (Auto action). As the “new” Giant-Man (see costume description below), he improved his optimal height to 35 feet (7 APs of Growth). At this time, his STR is not decreased until he uses more than 7 APs of Growth. When using 7 APs of Growth, he has a DEX reduced by 2 to a DEX of 04, a STR of 11, and a BODY of 08. At this time, if he were to use his maximum height (100 feet, 12 APs), he would have stats of DEX 02, STR 09, and a BODY of 10. 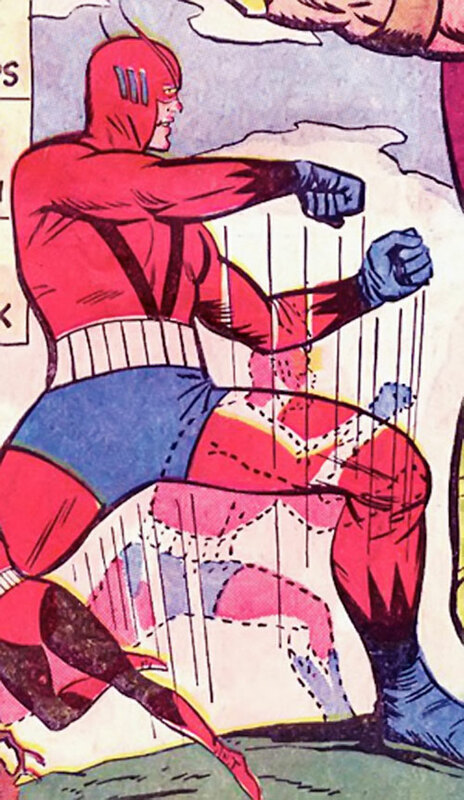 However, as the new Giant-Man, he began having difficulty with constant size-changes, meaning that he would choose to only switch between normal size and 35’ tall size. If he chooses to do otherwise, he suffers from dizzy spells. At this time, he also lost the ability to change sizes quickly, so he can no longer switch Growth on and also deactivate Growth in the same round. While using Growth, Giant-Man has a tendency to run into things more than he normally would (despite being able to dodge attacks with ease). Whenever he runs in a city while using Growth (whether to escape or to catch an enemy), he must make a check or be either unable to move the full distance (because he tripped over something or was stopped by power lines, for example) or unable to avoid crashing into something (treat as a Charge maneuver) at the GM’s discretion. Digging represents his ability to dig (with his hands) at greater than normal speed when shrunk, since he retains his normal human strength. The amount of material removed with Digging is affected by APs of Shrinking (but from Ant-Man’s perspective, he’s digging the usual amount with his Digging power). Digging may only be used when 10 APs of Shrinking are activated. Jumping may only be used when he is using 3 APs of Growth. Fabric Reducer [BODY 01, Shrinking: 10]. This liquid is kept in a bottle and is used to shrink fabrics. There is no apparent reason why it is different from the usual shrinking serum/gas/capsules. Rubber-band [BODY 01, Jumping: 00, Limit: Jumping may only be used by an ant-sized character]. This rubber band hooked on an ashtray was Ant-Man’s first design for a device to hurl him to the nearby window. He later used another rubber band hooked to another device. CATAPULT [BODY 01 STR 03, Limit: STR can only be used to hurl an ant-sized being, R#: 2]. Ant-Man uses this catapult to hurl himself from his lab to an alley near the police station or any other location where there is trouble. He signals ants to converge on the spot where he will land in order to catch him. When calculating how far he can be thrown, use his negative APs of weight. If the catapult fails its R#, Ant-Man will be tossed but not to exactly the right spot (meaning he might fly into a solid wall) ; in order to still be caught by his ant friends, he must make a Herculean effort with his Animal Summoning power. 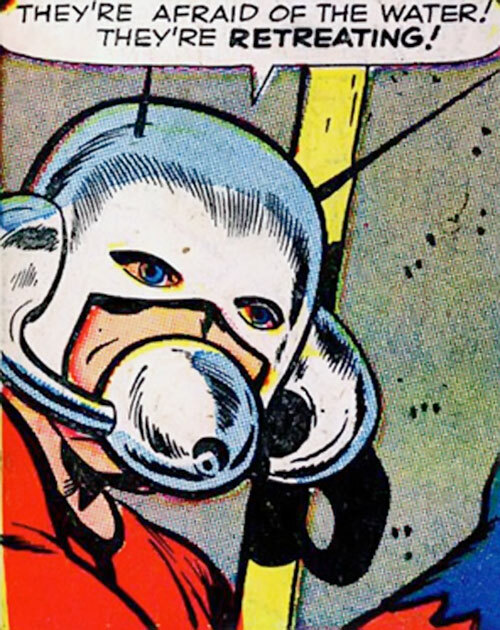 ALARM WATCH [BODY 01, Telepathy: 10; Limitations: this watch can only be used to receive telepathic messages from ants, and only lets Pym know that a telepathic message has arrived— he doesn’t know what the message is until he uses his helmet]. This is like Jimmy Olsen’s signal watch in reverse — when the ants have a message for Ant-Man, the watch makes a “Bzzzz” sound. THOUGHT-WAVE COMMUNICATOR [BODY 05, Telepathy: 12. Limitation: Telepathy can only be used to receive telepathic messages from ants. He is also able to tell where in the city the signal is coming from]. This item has the shape and size of a large bank of computers, with an attached headband/helmet. After the Wasp is introduced, this device can also use its Telepathy to communicate with her. CLOTHES OF UNSTABLE MOLECULES [BODY 01] These are ordinary-looking street clothes that Pym wears, which will shrink when he does. However, his ordinary clothes were able to shrink when he did in his first adventure, so I don’t know what the big deal is. FLAGPOLE TENSION CABLE DEVICE [BODY 02 STR 05, Stretching: 05]. Giant-Man has this device outside his lab. It enables him (as Giant-Man) to jump out the window, grab onto a hoop on the end of the flagpole outside the building, and then be gently lowered to the ground by the cable attached to the hoop. He can also use it to get up to his lab faster, by having it pull him up from the ground ; for this, he uses a remote control. Suction-Tipped Spring-Powered Climbing Device [BODY 01, Jumping: 04, STR 04, Stretching: 08, Snare: 08]. This device has one end with tiny pods that adhere to any surface (STR) as well as a long line (Stretching) that can reel in anyone that holds onto it. The sticky end also propels itself upwards to stick to something (Jumping). If spun around someone, it can be used to entrap them (Snare). Radioactivity Immunity Gas [BODY 00, Sealed Systems: 12. Limitation: This gas only protects against radiation]. Pym was asked by the military to develop this gas, which the Commies might’ve stolen if not for Ant-Man ! Oily Chemical [BODY 00 STR 08. Limitation: STR may only be used to defend against Grapple attempts, Snare attacks, or Glue attacks]. Ant-Man used this chemical to cover his costume before battling Egghead who planned to use flypaper (which has the Glue power) against Ant-Man. Unstable Molecules Gas Mask [BODY 01, Sealed Systems: 08, Chameleon: 01. Limitations: Sealed Systems only protects against gas attacks. Chameleon may only be used to adjust the size of the mask to fit the wearer]. This transparent full-head mask was developed by Pym for the military. CYBERNETIC ALARM [BODY 02, Speak with Animals: 12, Telepathy: 12]. This alarm is activated by ants who need to communicate the existence of danger. MASTER HELMET [BODY 02, Speak with Ants: 22, Special: This Speak with Ants power should be treated as a variation on “Speak with Plants” not “Speak with Animals]. This helmet is hooked into ant hills throughout every continent on Earth. Power Ray [BODY 02, Acid: 11, R#03]. Tony Stark made the plans for this device, but Hank redesigned it to fit his own needs. The rays of this rifle project acid capsules capable of dissolving Kang’s equipment-laden costume, as well as several of Kang’s missiles. DEXT: 02, STRE: 07, BODY: 6, INT: 0, WILL: 0, MIND: 1, INFL: 0, AURA: 0, SPIRIT: 1, Shrinking: 10 (always on, reduces STR), Telepathy: 02 (only to communicate with other ants)]. When Pym is in an encounter where every creature is of a small size, treat all creatures as if they had 10 fewer APs of Shrinking. Any creature starting with fewer than 10 APs of Shrinking should be treated as if they had the appropriate APs of Growth instead. 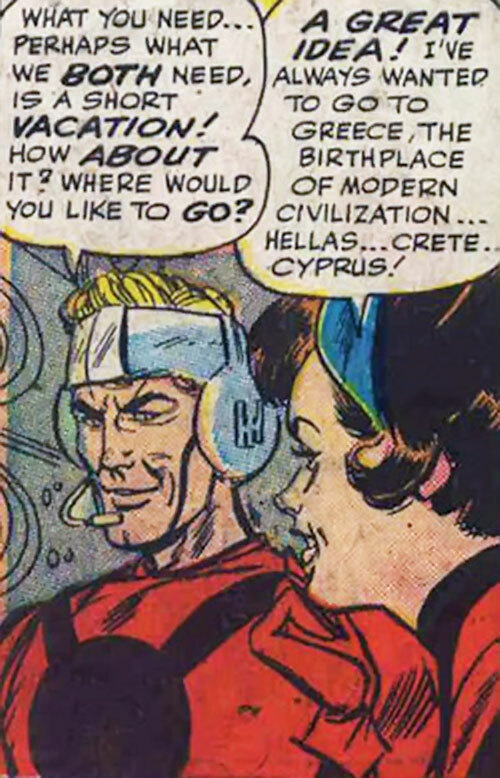 Source of Character: Marvel Comics, up to June 1965.